Amidst all that is going on in the world presently, there is an ongoing struggle to preserve pieces of the past in all shapes and forms. This is experienced all around the world in almost every type of environment, and by almost every person on the planet. Whether they be in a place that has existed for thousands of years, or for just a few hundred, people on Earth are connected to the past in some way. Being a part of this, we all have our own perceptions and views on the past, whether they be our ancestors, or famous events, or survived artifacts, all for better or for worse. From this view on the world came my first attempt at applying geomatics and GIS capabilities to archaeology, history, and heritage preservation. To provide some background on myself, my name is Alan Armstrong and I am a 4th year geomatics major with Greek and Roman Studies and History minors on the side. I am also a previous graduate of Carleton University from 2011 where I graduated with a focus in classics, history, and heritage preservation, with further experience working with museums and historical sites. In first hearing about geomatics early in 2017, then following up how this can be applied to my own background and vise versa, I reached out to the geomatics program at Carleton University. After a couple meetings with the head of the program, as well as reviewing my life and career at the time, I eventually made the decision to return to university with the goal of not only expanding and bettering myself, but to expand and discover new ways to implement geomatics with everything history. 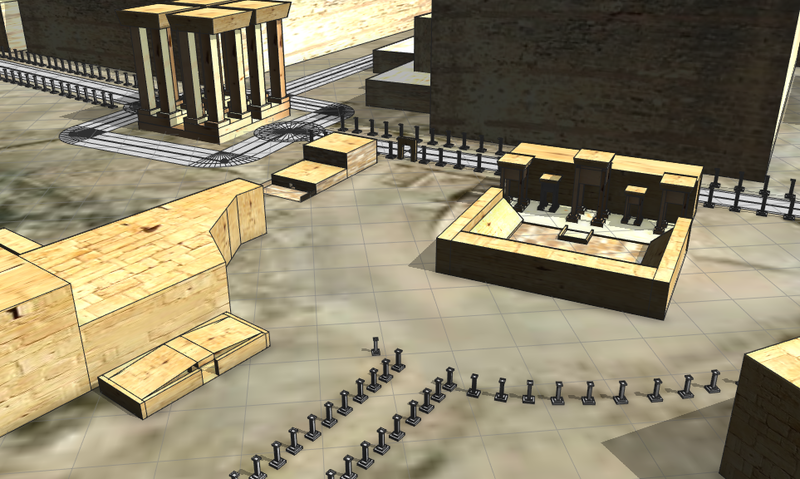 And to test what this implementation can do, I built the ancient city of Palmyra by way of Esri’s CityEngine software. 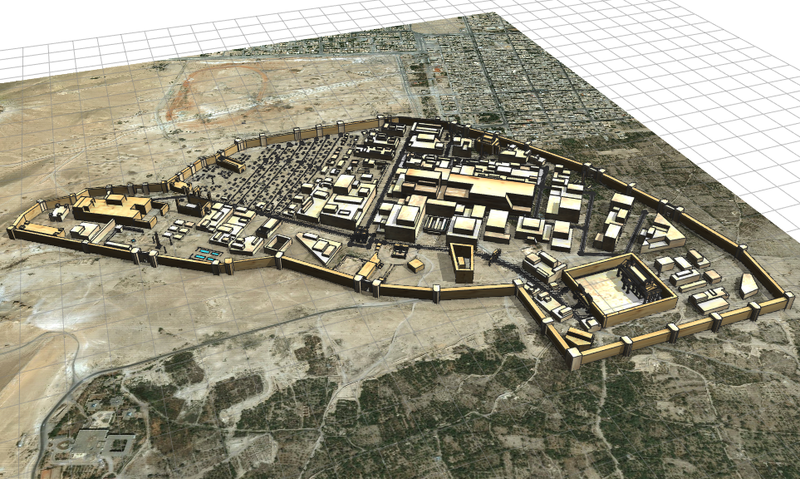 The project to build this city began as a final project for my second year GIS course in mapping the at-risk and already damaged historical and archaeological sites around the Middle East since 2001, but transitioned into this 3D city model after I discovered CityEngine and what it can do. Since this was my first time using the software, not to mention only being a geomatics student for three months at this point in 2017, the early stages of the project was slow going. I had to familiarize myself with the software in a test city format which include seeing what tools were available, what the workspace was like, and how I needed to set up the backend compared to ArcMap which is what I was using at the time. With the test period over and the AoI set along with the necessary research completed, I proceeded with building the city from scratch, beginning in the southeast corner of Palmyra. Using the archaeological record and found maps as guides, I built place-holder polygon shapes to mark where the buildings would go before returning to construct the buildings properly after this stage. 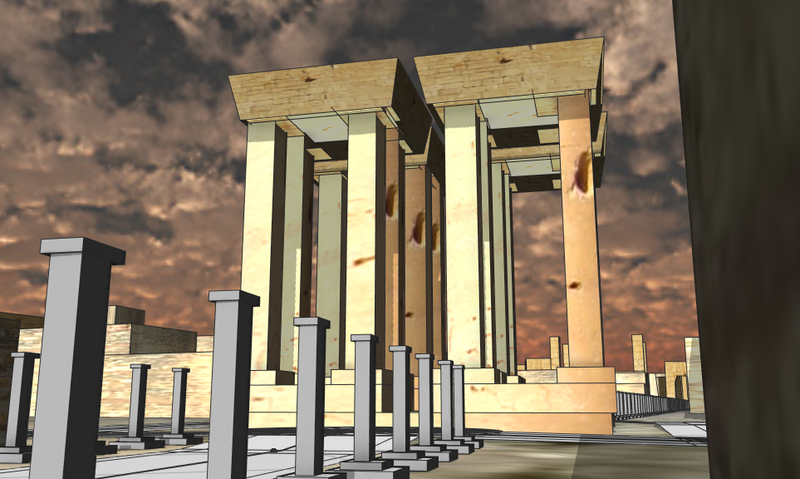 During this overall construction phase, I experimented with the road building tools, stressed over building-copying-pasting the hundreds of columns around the city, and performed trial and error on building the walls and towers so as to get them historically accurate as they would have looked like circa 300CE. Once I had finally completed the built structures stage, I moved onto the texturing stage. This was fun to experiment with but since I was close to the submission date at the time, I did not spend too long doing this. After finishing the texturing, I took one more look at the city and touched a few minor things up before calling it finished (after just under 22hrs over two and a half weeks) which you can see more pictures of in the included gallery. Overall, I was definitely pleased with what I had built, and despite the messiness and some technical issues experienced, I had become a fan of using CityEngine for my own and future geomatics work. 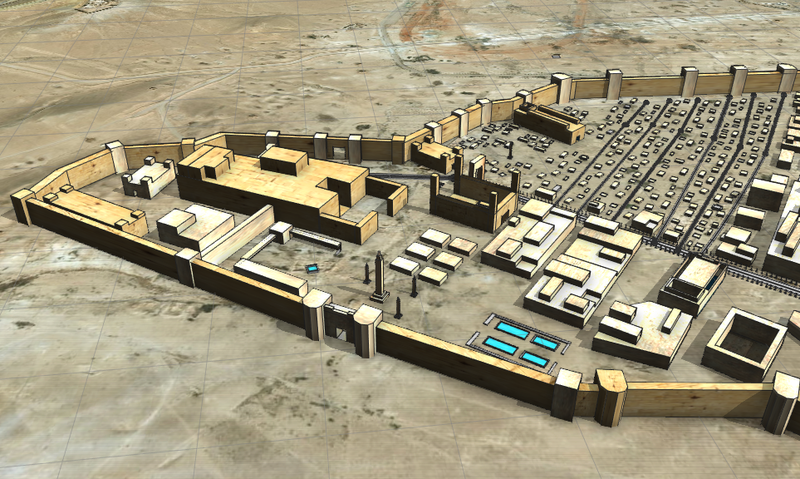 Building 3D models of ancient cities is not new, however using geospatial and satellite data to build these ancient cities right on top of where they once stood has only just started. In fact, geospatial technology and processes such as LiDAR and statistical analysis are being applied to archaeology and heritage preservation that is leading to new developments, discoveries, and interpretations of the ancient world. 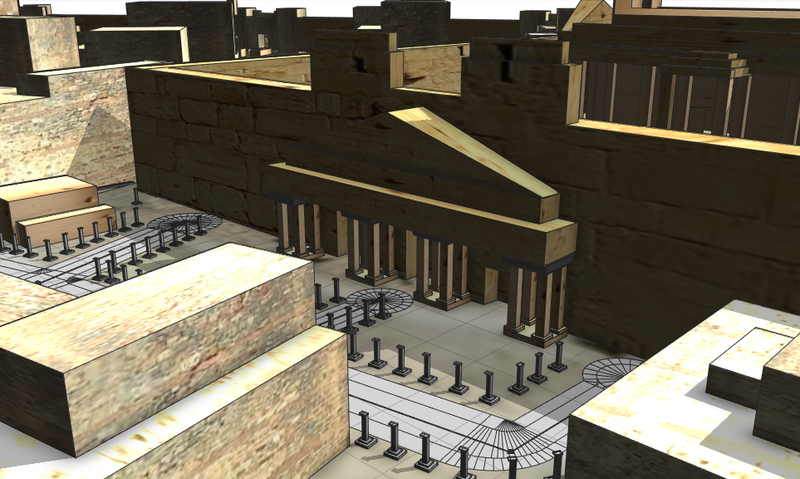 A project such as this one allows people to reconstruct ancient sites in less time and with more detail, whereas in decades to even centuries past guesswork and assumptions were what historians and archaeologists relied on to better understand the world that far proceeded them. I for one am continuing with this application of geomatics and GIS to archaeology, history, and heritage preservation, and am gradually putting my dreams into reality using everything that geomatics has to offer. 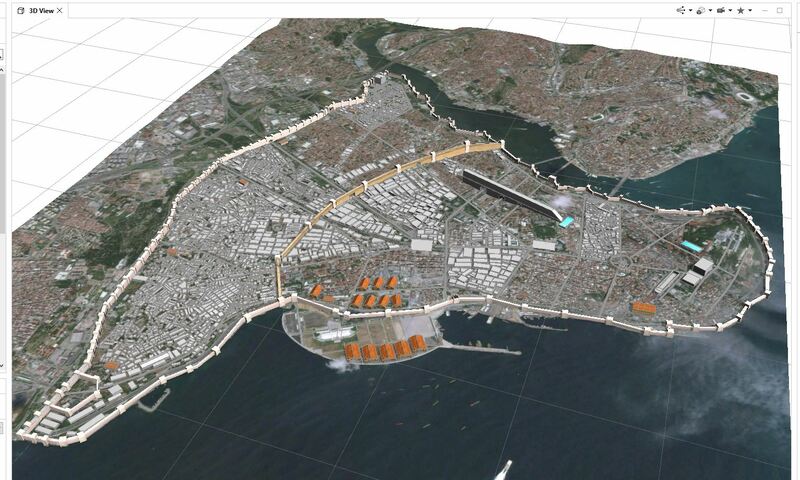 Currently, I am using CityEngine again to build Constantinople cir.500CE for a geospatial analysis course, as seen in Fig.7 below, and will be posting the completed result on the CityEngine community page when it is finished for the geomatics and GIS community to see what this melding of fields can further do for each other. Through what I have done so far in geomatics, I have a strong idea of what can be accomplished with the union of these two fields in today’s world, but in the future’s world, who knows what will be discovered, what will be improved upon, and what will be the next stage of geospatial history and archaeology.